There's been a lot of talk among Los Jalops about the possibility of entering a car in the 24 Hours of LeMons race. Yes, we've been burning up the IM wires with our heated debates on the merits of various cars (a mid-80s Supra? A basket-case WRX available miraculously cheap? A P71 Crown Vic? ), and you all even jumped in on the fun. But what it comes right down to is the fact that we want to win. And what dominated the track last weekend? Yes, BMWs and Honda CRXs. So, we've dug up one of each that squeeze under the $500 price barrier; feel free to knock-down-drag-out debate their respective merits and flaws. The Honda CRX is small, fast, handles well, and can be had dirt freakin' cheap if you don't care what it looks like. We like the looks of this '89 CRX, which is priced just at the $500 LeMons ceiling, but that ceiling is obviously made of very stretchy stuff, plus the seller will not refuse any "RESONABLE" (sic) offers, meaning you'll be able to provide some highly effective downward pressure on the price. So ya get this car, put in a cage (safety equipment is not covered by the $500 limit), and then start looking for a cheap Integra engine to drop in. Oh yes, and some railroad-tie bumpers. Sure, a car that's been slammed, abused, and beaten like this one so obviously has will need a bunch of stuff fixed before it's ready to race, and the Integra swap involves Fun With Axles... but you need to go through Hell before you can chase the checkered flag, right? Yeah, there were more CRXs contending at LeMons than you could shake a broken connecting rod at, but what kind of car finished first and second? That's right, BMWs. They may not be able to squeeze all CRX-like between the Buick Century and the Nissan Maxima in Turn Two, but they can take a lot more punishment then Soichiro's cut-down Civic and they're pretty quick. Not only that, you can get this '79 528i for a mere $250. It needs a head gasket (and, hell, maybe the head and/or block have great big cracks to boot), but you'll be able to deal with that while you're figuring out a way to turbocharge the engine on a $200 junkyard budget. 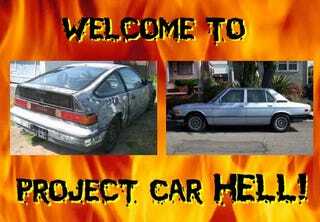 The hell will come in when you're trying to sort out all the funky electrical problems you're sure to find- never mind that you're tearing out most of the wiring- and then start on the process of building a full-on race car on your three-figure junkyard budget.